No event could be considered more dramatic than the crucifixion of Jesus Christ, both in its barbarous violence and its extraordinary repercussions. No event, also, can have a greater significance for someone with a strong and vibrant Christian faith. Composers have sought to contain the essential elements of the story within the span of a musical work and probably no one has come closer to touching the universality of this tragedy-turned-triumph than Bach in his St Matthew Passion. If ever there is an example of what MacMillan refers to as the ‘silence and sacrifice’ required of the listener so that the ‘interaction bears the greatest fruit’ it must be this work, one of the pillars of our civilization. Bach’s St John Passion is pithier and, partly because of its much shorter duration, apparently more dramatic. 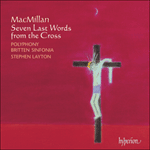 But the St Matthew Passion, whilst being inherently dramatic, transcends drama; in many ways (without making invidious and impossible comparisons) MacMillan does similar things with his Seven Last Words from the Cross. This work was commissioned by BBC television for screening in seven separate episodes during Holy Week in 1994. It was premiered by Cappella Nova and the BT Scottish Ensemble directed by Alan Tavener. The seven short sentences Jesus uttered from the Cross would make a short work indeed if taken at face value, and MacMillan felt that one of the great challenges he faced was to flesh out the text to make a substantial piece. Thus movements one, three, five and six take Christ’s final utterances and add complementary texts from various sources – the Palm Sunday Exclamation and Good Friday Responsories for Tenebrae in the first movement, a Good Friday versicle in movement three, part of the Good Friday Reproaches in the fifth movement and another extract from the Good Friday Responsories for Tenebrae in the sixth. The remarkable thing about this work is that it is both a meditation on the horrific events which gave rise to these last utterances and an intense fully fledged drama which might as easily be staged. Of course the potential for a visual element was important – it was, after all, commissioned by television for people to watch as well as to listen to – but this was not MacMillan’s real concern. He wanted, as he said, to ‘explore the words in a very personal way’, one which served his central purpose of getting people to interact with the music as serious listeners so that they were in some way changed by it. There have been a number of works written around Jesus’s last words: Haydn’s ‘deep throbbing melancholy’ as MacMillan describes it, and later the French composer Théodore Dubois’ ‘saccharine’ setting in the Catholic pietistic style, and much later still Sofia Gubaidulina’s wholly different approach which as MacMillan puts it has a ‘sense of synthesis and delight in bringing old and new together’. And this is, in some part, what MacMillan himself has done. The opening of the second movement, ‘Woman, Behold thy Son! … Behold, thy Mother!’, refers to Bach, ‘evoking memories of the Passion chorales’. MacMillan also said ‘I love stories that go tragically and horribly wrong, laden with so many extreme possibilities for music. And I am drawn to extremes – extremes of good and evil, of tranquility and violence.’ Here, in this scenario, he has the perfect vehicle through which to allow his imagination full rein. The first movement uses a mesmerizing cadential figure which MacMillan used originally in Tuireadh for clarinet and strings written in 1991 (it appears about half-way through Tuireadh and is then formed and transformed like a mantra throughout the rest of the work). ‘Tuireadh’ is a Gaelic word meaning ‘lament’ and this figure which MacMillan uses for his Seven Last Words has an almost mystical sense of keening regret, of sighing melancholy. The work begins with this motif over which sopranos sing, chant-like, the first of Christ’s words – ‘Father, forgive them, for they know not what they do’ – joined gradually by the altos. This figure is present throughout the movement, providing a constant sense of the ‘otherness’ of Jesus (rather like the ‘halo’ of strings Bach gives Christus in the St Matthew Passion). The tenors and basses soon start a quiet but insistent quick-fire interjection of ‘Hosanna to the son of David’ (in Latin) from the Palm Sunday Exclamation, joined by the violins. The superimposition of, and then giving way to, a plainsong monotone sung by the sopranos to words from the Good Friday Reponsories for Tenebrae (in English) brings the movement to a pathetic unaccompanied end with the words ‘For there was no one who would acknowledge me or give me help’. The second movement, ‘Woman, Behold thy Son! … Behold, thy Mother!’, starts with fortissimo unaccompanied statements of the Bach-like Passion chorale figure already mentioned interspersed with granite-like blocks of silence. The strings begin warmly but become increasingly agitated, building to a frenetic climax while the choir continues to chant the chorale figure heard at the opening in different harmonic guises. The movement ends with exhausted falling figures from the strings. The third movement is in stark contrast to what has gone before. Jesus’s words ‘Verily, I say unto thee, today thou shalt be with me in Paradise’ appear only briefly at the end of the movement at an incredibly high tessitura for sopranos accompanied by violins, reflecting the ascent to Paradise. The bulk of the movement is given to a setting of words from a Good Friday antiphon, Ecce lignum Crucis. MacMillan has pointed out that during the liturgy this is normally sung three times, each time at a higher pitch as the Cross is slowly unveiled and revealed to the people. The slow, quiet first part is sung by the tenors and basses and returns after a second contrasting section where the strings settle into an almost indulgent music complete with a delicious high violin solo which in turn returns. A third section (related to the first through the decorated melodic first violin part) is an extraordinary tour de force of string-writing powerfully reminiscent of Tippett’s Concerto for Double String Orchestra and the whole panoply of English string orchestra-writing which preceded that landmark work. Jesus’s words act like a short coda to the movement. The fourth movement, ‘Eli, Eli, lama sabachthani?’, is formed like a huge arch beginning with long, slow notes on the double basses, working its way upwards through orchestra and choir to very high-pitched phrases and all the way down again to finish as it began. Throughout this movement there are very highly decorated vocal lines – a feature of much of MacMillan’s choral music which is in some way a throw-back to the fantasy-like decoration of Tudor composers, and specifically to the music of fellow Scot Robert Carver (1490–c1546), a highly influential figure for MacMillan. The fifth movement is bleak. It sets Jesus’s two simple words ‘I thirst’ together with the wonderful text from the Good Friday Reproaches ‘I gave you to drink of life-giving water from the rock: and you gave me to drink of gall and vinegar.’ Jesus’s despair at his physical need for water is set slowly and just once erupts into a shout before subsiding again. The Reproaches text shimmers like a whispered chant. The movement ends with the strings building from a unison F sharp (G flat) to a climax which is marked ‘like a violent shuddering’ before subsiding again to the single G flat. With the sixth movement, ‘It is finished’, we are brought face to face with the hammer-blows of the nails being driven into Christ’s hands and feet. Shocking, repeated chords from the strings lead to quiet singing bringing back the tuireadh progression from the first movement. Here the text ‘My eyes were blind with weeping’ from the Good Friday Responsories for Tenebrae is combined with Jesus’s words which are sung to the tuireadh progression. More hammer-blows accompany the sopranos’ serene singing of Jesus’s words and the movement ends with the continuing violation by those driven nails. The final sighs from the violins are like the final breaths of the dying Christ and bring to a close a masterpiece of our time. Nul événement ne saurait être perçu comme plus dramatique que la crucifixion de Jésus-Christ, que ce soit par sa violence barbare ou par ses extraordinaires répercussions. Nul événement, non plus, ne pourrait revêtir plus d’importance aux yeux de ceux qu’habite une foi chrétienne forte et vibrante. Les compositeurs ont cherché à réunir les éléments fondamentaux de cette histoire dans les limites d’une œuvre musicale, et aucun, probablement, n’a approché autant l’universalité de cette tragédie faite triomphe que Bach dans la Passion selon saint Matthieu. S’il est un exemple du «silence et du sacrifice» exigés de l’auditeur pour que «l’interaction soit des plus fructueuses» (MacMillan), c’est bien cette œuvre, l’un des piliers de notre civilisation. La Passion selon saint Jean, du même Bach, est plus lapidaire et, parce qu’elle dure moins longtemps, semble plus dramatique. Mais, tout en étant foncièrement dramatique, la Passion selon saint Matthieu transcende le drame, ce que MacMillan fait aussi, à maints égards, avec ses Seven Last Words from the Cross (sans pour autant se livrer à des comparaisons injustes et impossibles). Commande de la télévision (BBC), cette œuvre, diffusée en sept épisodes distincts durant la Semaine sainte de 1994, fut créée par Cappella Nova et le BT Scottish Ensemble, sous la direction d’Alan Tavener. Prises telles quelles, les sept courtes phrases prononcées par Jésus en croix feraient une œuvre bien courte et MacMillan sentit qu’un de ses plus grands défis consistait à les étoffer pour en faire quelque chose de substantiel. Ainsi les mouvements 1, 3, 5 et 6 proposent-ils les dernières paroles du Christ augmentées de textes d’origines diverses – l’acclamation du dimanche des Rameaux et les répons des Ténèbres du Vendredi saint (premier mouvement), un verset du Vendredi saint (troisième mouvement), deux extraits des Impropères du Vendredi saint (un dans le cinquième mouvement, un autre dans le sixième). Cette œuvre a ceci de remarquable qu’elle est à la fois une méditation sur les événements horribles qui donnèrent lieu à ces dernières paroles et un drame intense complet, facile à mettre en scène. Bien sûr, le potentiel visuel était important – il s’agissait, au fond, d’une commande de la télévision, à voir autant qu’à entendre –, mais là ne fut pas le vrai souci de MacMillan qui voulut «explorer les mots d’une manière toute personnelle», une manière qui servit son grand dessein: faire interagir les auditeurs sérieux avec la musique pour qu’ils s’en trouvent, en quelque sorte, changés. Plusieurs œuvres furent écrites autour des dernières paroles de Jésus: après la «grave et lancinante mélancolie» de Haydn, pour reprendre MacMillan, vinrent la version «sirupeuse» du Français Théodore Dubois, dans le style piétiste catholique, et, bien plus tard encore, l’approche radicalement différente de Sofia Gubaidulina, dotée d’un «certain sens de la synthèse et du délice en réunissant l’ancien et le nouveau» (MacMillan). Et c’est un peu ce que MacMillan a fait, lui aussi. L’ouverture du deuxième mouvement «Femme, voilà ton fils! … Voilà ta mère!» renvoie ainsi à Bach en «évoquant le souvenir des chorals de la Passion». Le compositeur déclara: «J’adore les histoires qui tournent tragiquement et horriblement mal, chargées de tant de possibilités musicales extrêmes. Et les extrêmes m’attirent – extrêmes du bien et du mal, de la tranquillité et de la violence.» Ce scénario est pour lui le parfait moyen de donner libre cours à son imagination. Le premier mouvement recourt à une figure cadentielle ensorcelante, originellement utilisée dans Tuireadh (1991), une œuvre de MacMillan pour clarinette et cordes, où elle apparaît à mi-parcours avant d’être formée et transformée, tel un mantra, jusqu’à la fin. En gaélique, tuireadh signifie «lamentation», et cette figure que MacMillan réutilise dans ses Seven Last Words exhale un sentiment quasi mystique de profond regret, de mélancolie soupirante. L’œuvre s’ouvre sur ce motif, par-dessus lequel les sopranos entonnent, à la mode grégorienne, la première des paroles du Christ – «Père, pardonnez-leur car ils ne savent pas ce qu’ils font» –, peu à peu rejoints par les altos. L’omniprésence de cette figure dans le mouvement nous fait ressentir constamment l’«altérité» de Jésus (un peu comme le «halo» de cordes que Bach offre au Christ dans la Passion selon saint Matthieu). Les ténors et les basses, rejoints par les violons, se lancent bientôt dans l’interjection-rafale, paisible mais insistante: «Hosanna au fils de David» (en latin), tirée de l’acclamation du dimanche des Rameaux. D’abord surimposé puis seul, un ton monocorde en plain-chant, exécuté par les sopranos sur des paroles empruntées aux répons des Ténèbres du Vendredi saint (en anglais), offre au mouvement une conclusion pathétique, a cappella, sur les mots «Car il n’y eut personne pour me reconnaître ni pour m’aider». Le deuxième mouvement, «Femme, voilà ton fils! … Voilà ta mère!» s’ouvre sur des énonciations a cappella fortissimo de la figure de choral de la Passion bachienne susmentionnée, mêlées à des blocs de silence granitiques. D’abord chaleureuses, les cordes gagnent en agitation jusqu’à atteindre un apogée frénétique, le chœur, lui, continuant de psalmodier, sous différents dehors harmoniques, la figure de choral entendue au début. Le mouvement s’achève sur des figures descendantes exténuées, aux cordes. Le troisième mouvement tranche violemment avec tout ce qui précède. Les paroles de Jésus, «En vérité je vous le dis, aujourd’hui vous serez avec moi au Paradis», ne surviennent que brièvement en fin de mouvement, à une tessiture incroyablement aiguë pour les sopranos, lesquels, accompagnés des violons, symbolisent la montée au Paradis. L’essentiel de ce mouvement met en musique le texte d’une antienne du Vendredi saint, Ecce lignum Crucis. Comme l’a souligné MacMillan, la liturgie prévoit normalement de la chanter trois fois, à une hauteur de son de plus en plus élevée à mesure que la croix est doucement dévoilée et révélée au peuple. Lente et paisible, la première partie, confiée aux ténors et aux basses, revient après une deuxième section contrastée, où les cordes se lancent dans une musique presque indulgente, avec un délicieux solo aigu de violon qui revient, lui aussi. Une troisième section (affiliée à la première par la partie mélodique ornée, au violon) est un véritable tour de force pour cordes, dont l’écriture rappelle puissamment le Concerto for Double String Orchestra de Tippett et toute la panoplie de l’écriture anglaise pour orchestre à cordes d’avant cette œuvre phare. Les paroles de Jésus font comme une brève coda au mouvement. Le quatrième mouvement, «Eli, Eli, lama sabachthani?», est une immense arche qui s’ouvre sur de longues notes lentes aux contrebasses puis grimpe, via le chœur et l’orchestre, jusqu’à des phrases aux hauteurs de son fort élevées pour finalement redescendre à son point de départ. L’ensemble est émaillé de lignes vocales aux ornementations très hautes, caractéristiques de nombreuses pièces chorales de MacMillan, qui signa là une sorte de retour à la décoration de type fantaisie des compositeurs Tudor – notamment de Robert Carver (1490– env. 1546), ce compatriote écossais qui l’influença tant. Le cinquième mouvement, austère, met en musique ces mots tout simples de Jésus, «J’ai soif», aux côtés du merveilleux texte des Impropères du Vendredi saint: «Je t’ai donné à boire l’eau vivifiante du rocher: et tu m’as fait boire du fiel et du vinaigre.» Le désespoir de Jésus face à son besoin physique d’eau est mis en musique lentement et n’éclate en cri qu’une seule fois, avant de s’apaiser de nouveau. Le texte des Impropères frémit comme une psalmodie marmottée. Puis le mouvement s’achève sur les cordes qui, parties d’un fa dièse (sol bémol) à l’unisson, atteignent un apogée marqué «comme un violent tremblement» avant de retomber au sol bémol. Le sixième mouvement, «C’est accompli», nous confronte directement aux coups de marteau qui enfoncent les clous dans les mains et les pieds du Christ. D’atroces accords répétés aux cordes débouchent sur un chant paisible, rappelant la progression à la tuireadh du premier mouvement. Ici, le texte «Mes yeux sont devenus aveugles à force de pleurer», tiré du répons des Ténèbres du Vendredi saint, est mêlé aux paroles de Jésus chantées sur la progression à la tuireadh. D’autres coups de marteau accompagnent les sopranos, qui chantent sereinement les paroles de Jésus, et le mouvement s’achève sur la profanation continuelle que sont ces clous que l’on enfonce. Le premier mot est prononcé trois fois, telle une exclamation angoissée, avant que la musique ne s’abaisse dans la résignation. Le chœur en a terminé – le reste de l’œuvre est assumé par les cordes seules. Lorsqu’on met en musique pareils textes, il est vital de conserver une objectivité émotionnelle si l’on veut maîtriser l’expression musicale, la liturgie du Vendredi saint étant une retenue de douleur, pleine de réalisme. Mais elle est aussi source d’inspiration quand on voit des gens pleurer de vraies larmes le Vendredi saint, comme si la mort du Christ était une tragédie personnelle. Dans ce dernier mouvement, au long postlude instrumental, le détachement liturgique disparaît au profit d’une réflexion plus intime: d’où la résonance de la lamentation traditionnelle écossaise. Les soupirs finals, aux violons, sont comme les derniers souffles du Christ mourant et closent ce chef-d’œuvre de notre temps. Kein Ereignis ist wohl so dramatisch wie die Kreuzung Jesu Christi, sowohl was die brutale Gewalt als auch die außerordentlichen Folgen betrifft. Kein Ereignis kann deshalb für einen Menschen mit einem starken und überzeugten christlichen Glauben von größerer Bedeutung sein. Diverse Komponisten haben versucht, im Rahmen eines musikalischen Werkes die wichtigsten Handlungsstationen wiederzugeben. Bach kam in seiner Matthäuspassion der Allgemeingültigkeit dieses sich schließlich in Triumph wendenden Dramas wohl am nächsten. Dieses Werk, eine der Säulen unserer Gesellschaft, ist wohl das beste Beispiel für MacMillans Forderung nach einem vom Hörer geforderten Hörverhalten aus „Ruhe und Opfer“, damit die „Interaktion … die größten Früchte trägt“. Bachs Johannespassion ist prägnanter und, teils aufgrund ihrer viel kürzeren Ausmaße, angeblich dramatischer. Aber die Matthäuspassion überschreitet das Drama, auch wenn sie von Natur aus dramatisch ist. In vielerlei Hinsicht (ohne dabei provozierende oder unpassende Vergleiche anzustellen) versucht MacMillan in seinen Seven Last Words from the Cross [Sieben letzte Worte am Kreuz] Ähnliches. Dieses Werk wurde vom BBC-Fernsehen in Auftrag gegeben und in sieben einzelnen Episoden in der Karwoche 1994 ausgestrahlt. Die Interpreten der Fernsehproduktion und der öffentlichen Uraufführung waren die Cappella Nova und das BT Scottish Ensemble unter der Leitung von Alan Tavener. Die sieben kurzen Sätze, die Jesus am Kreuz äußerte, würden tatsächlich ein kurzes Werk ergeben, wenn man sie als einen Monolog vertonen würde. Eines der größten Schwierigkeiten bestand deshalb für MacMillan in der rechten Ergänzung des Textes zur Schaffung eines ausgedehnten Werkes. Der Komponist entschied sich schließlich, die letzten Äußerungen Christi in den Sätzen eins, drei, fünf und sechs mit Texte aus diversen anderen Quellen zu ergänzen: die Hosanna-Rufe am Palmsonntag und die Tenebrae-Responsorien für Karfreitag im ersten Satz, der Ruf zur Kreuzerhebung am Karfreitag im dritten Satz, Teil der Karfreitagsimproperien im fünften Satz und ein weiterer Ausschnitt aus den Tenebrae-Responsorien für Karfreitag im sechsten. Beachtenswert in diesem Werk ist die Kombination aus einer Meditation über die schrecklichen Ereignisse, die zu diesen letzten Äußerungen führten, und einem intensiven, voll ausgereiften Drama, das man auch leicht auf die Bühne bringen könnte. Natürlich war das inhärente visuelle Element wichtig – schließlich war es ein Auftragswerk des Fernsehens, dem die Menschen nicht nur zuhören, sondern auch zuschauen sollten. Aber dafür interessierte sich MacMillan nicht so stark. Nach seiner Aussage wollte er: „die Worte in einer sehr persönlichen Weise ausloten“, nämlich in Übereinstimmung mit seinem zentralen Anliegen, Menschen als ernste Hörer mit Musik zusammenzuführen, damit sie durch Musik irgendwie verändert werden. Eine Reihe von Komponisten haben sich den letzten Worte Jesu Christi musikalisch genähert: Haydn in seiner „stark gefühlten Melancholie“, wie es MacMillan beschrieb, und später der französische Komponist Théodore Dubois in seiner „zuckersüßen“ Vertonung im katholischen pietistischen Stil, und noch viel später Sofia Gubaidulina in ihrem ganz anderen Werk, das, wie MacMillan es formuliert, eine „Art Synthese und Freude beim Vereinen von Altem und Neuem“ darstellt. In gewisser Weise ist es auch das, was MacMillan selbst geschaffen hat. Der Anfang des zweiten Satzes, „Woman, Behold thy Son! … Behold, thy Mother!“ [Frau, siehe, dein Sohn! … Siehe, deine Mutter! ], bezieht sich auf Bach und „beschwört Assoziationen mit den Passionschorälen“. MacMillan sagte auch: „Ich liebe Geschichten, die tragisch enden und schrecklich verlaufen und damit so viele extreme Möglichkeiten für Musik bieten. Und mich zieht es stark zu Extremen – Extreme von Gut und Böse, von Friede und Gewalt.“ Hier in dieser Handlungsvorlage hat er das perfekte Medium, mit dessen Hilfe er seiner Vorstellungskraft völlig freien Lauf lassen kann. Im ersten Satz erklingt eine bezaubernde kadenzierende Geste, die MacMillan ursprünglich in seinem 1991 komponierten Werk für Klarinette und Streicher, Tuireadh, komponierte hatte (es taucht dort ungefähr in der Mitte des Werkes auf und wird dann im restlichen Teil umgeformt und verwandelt wie ein Mantra). „Tuireadh“ ist ein gälisches Wort für „Klage“. Diese musikalische Geste, die MacMillan in seinen Sieben letzten Worten wiederverwendet, enthält ein fast mystisches Element von wehklagendem Bedauern und seufzender Melancholie. Das Werk beginnt mit diesem Motiv. Darüber singen die Soprane choralartig die ersten Worte Christi „Father, forgive them, for they know not what they do“ [Vater vergib ihnen, denn sie wissen nicht, was sie tun]. Die Altstimmen schließen sich sukzessiv an. Die Geste taucht im gesamten Verlauf des Werkes immer wieder auf und verbreitet damit ein ständiges Gefühl für das „Unbegreifliche“ in Jesus (in etwa vergleichbar mit dem durch Streicher geschaffenen Heiligenschein, der in Bachs Matthäuspassion Christus begleitet). Die Tenöre und Bässe werfen kurz darauf leise aber beharrlich sich schnell einander abwechselnde lateinische Zwischenrufe ein, deren Text aus den Hosanna-Rufen am den Palmsonntag stammen: „Hosanna filio David“ [Hosanna, dem Sohne Davids]. Auch die Streicher nehmen daran teil. Darüber wird ein einstimmiger gregorianischer Choral im Sopran auf Worte aus den Tenebrae-Responsorien für Karfreitag (auf Englisch) gelagert, der später allein zurückbleibt und damit den Satz zu einem würdevollen a cappella gesungenen Abschluss bringt auf die Worten „For there was no one who would acknowledge me or give me help“ [Weil es niemand gab, der sich zu mir bekannte oder mir Hilfe anbot]. Der zweite Satz „Frau, siehe, dein Sohn! … Siehe, deine Mutter!“ beginnt mit den schon oben erwähnten fortissimo und a cappella gesungenen Gesten im Stile von Bachs Passionschorälen. Sie werden von granitartigen Blöcken der Stille unterbrochen. Die Streicher beginnen warm singend, werden aber zunehmend von einer Unruhe ergriffen, die sich zu einem frenetischen Höhepunkt steigert, während der Chor weiterhin die zu Beginn vernommene Choralgeste in unterschiedlichen harmonischen Varianten singt. Der Satz endet mit erschöpften, fallenden Gesten in den Streichern. Der dritte Satz steht in starkem Kontrast zu dem Vorangegangenen. Die Worte Jesu: „Verily, I say unto thee, today thou shall be with me in Paradise“ [Amen, ich sage dir: Heute noch wirst du mit mir im Paradies sein], erscheinen nur kurz gegen Ende des Satzes in einer unglaublich hohen Stimmlage für die Soprane, die von Violinen begleitet werden und den Aufstieg ins Paradies darstellen. Ein Großteil des Satzes ist der Vertonung der Karfreitagsantiphon „Ecce lignum Crucis“ gewidmet. MacMillan wies darauf hin, dass sie in der Liturgie normalerweise dreimal gesungen wird, jedes Mal auf einem höheren Ton, während dabei das Kreuz langsam enthüllt und der Gemeinde sichtbar wird. Der langsame, ruhige, erste Teil wird von den Tenören und Bässen gesungen und kehrt nach einem zweiten, kontrastierenden Abschnitt, in dem sich die Streicher eine fast wollüstige Musik einschließlich eines herrlichen hohen Violinsolos gestatten, wieder zurück. Auch der zweite Abschnitt wird wiederholt. Ein dritter Abschnitt (der durch die verzierte melodische Stimme der ersten Violine mit dem ersten Teil verwandt ist) erweist sich als ein außerordentlicher Kraftakt für die Streicher und erinnert damit stark an Tippetts Konzert für doppeltes Streichorchester und die ganze Palette englischer Streichorchesterkompositionen, die vor diesem Meilenstein entstanden. Die Worte Jesu bilden in diesem Satz als eine Art kurze Koda. Der vierte Satz, „Eli, Eli, lama sabachthani?“ [Mein Gott, mein Gott, warum hast du mich verlassen?] wurde in eine riesige Bogenform gegossen und beginnt mit langen, langsamen Noten in den Kontrabässen, arbeitet sich durch das Orchester und den Chor bis zu sehr hohen musikalischen Phrasen nach oben, und kehrt dann wieder den ganzen Weg nach unten zurück zum Ausgangspunkt. Im ganzen Satz gibt es sehr stark verzierte Vokalstimmen – wie in vielen Chorwerken von MacMillan – die damit auf gewisse Weise eine Brücke zu den reich verzierten Fantasias der englischen Komponisten des 15. und 16. Jahrhunderts schlagen, besonders zur Musik von MacMillans schottischem Landsmann Robert Carver (1490–ca. 1546), der für MacMillan äußert wichtig war. Der fünfte Satz ist düster. Hier wurden die zwei einfachen Worte Jesu, „I thirst“ [Mich dürstet] zusammen mit dem wunderbaren Text aus den Karfreitagsimproperien, „Ego te potavi aqua salutis de petra: et tu me potasti felle et aceto“ [Als meinen erlesenen Weinberg pflanzte ich dich, du aber brachtest mir bittere Trauben, du hast mich in meinem Durst mit Essig getränkt], vertont. Die Verzweiflung Jesu bei seinem körperlichen Bedürfnis nach Wasser findet in langsamer Musik ihren Niederschlag. Nur einmal bricht sie in einen Schrei aus, bevor sie wieder abklingt. Der Improperiumstext schimmert wie ein geflüsterter gregorianischer Choral. Der Satz schließt mit den Streichern, die von einem unisono gespielten Fis (Ges) ausgehend einen Höhepunkt ansteuern, der in der Partitur mit dem Hinweis „wie ein gewaltsamer Schauder“ versehen ist. Dann beruhigt sich das Geschehen wieder und kehrt zu einem einfachen Ges zurück. Im sechsten Satz, „It is finished“ [Es ist vollbracht], erleben wir die Hammerschläge, mit denen die Nägel durch die Hände und Füße Christi getrieben werden. Schockierende Akkordwiederholungen in den Streichern gehen in ein ruhiges Singen über, wo auch die Tuireadh-Geste aus dem ersten Satz wieder aufgenommen wird. Hier wird der Text „My eyes were blind with weeping“ [Meine Augen waren vor Weinen blind] aus den Tenebrae-Responsorien für Karfreitag mit den Worten Jesu verbunden, die auf die Tuireadh-Musik erklingen. Weitere Hammerschläge begleiten den friedlichen Gesang der Soprane auf die Worte Jesu. Der Satz endet mit erneuter Gewalt beim Einhämmern der Nägel. Das erste Wort wird dreimal qualvoll ausgerufen. Dann zieht sich die Musik resigniert zurück. Der Chor ist fertig – das Werk wird danach von den Streichern allein beendet. Wenn man solche Texte vertont, ist es äußerst wichtig, dass man zur Kontrolle des musikalischen Ausdrucks einen gewissen emotionalen Abstand bewahrt, genau wie die Karfreitagsliturgie ein Eindämmen der Trauer mithilfe der Nacherzählung ist. Allerdings ist es ergreifend, wenn man Menschen erlebt, die am Karfreitag tatsächlich weinen, als sei der Tod Christi eine persönliche Trauer. In diesem letzten Satz mit seinem langen instrumentalen Nachspiel bricht der liturgische Abstand zusammen und erlaubt eine persönlichere Reflektion: deshalb hier die Anklänge an traditionelle schottische Klagemusik. Die abschließenden Violinseufzer entsprechen den letzten Atemzügen des sterbenden Christi und runden ein Meisterwerk unserer Zeit ab. Rex Israel, Hosanna in excelsis. Men rose up against me without mercy and spared not my life. Movement 2: Woman, Behold thy Son! … Behold, thy Mother! Woman, Behold thy Son! … Behold, thy Mother! on which the saviour of the world was hung. Movement 4: Eli, Eli, lama sabachthani?